I don’t remember, did Elena start the season a blubbering mass of tears? Oh, no, she had the summer of bliss with Damon, which was immediately ruined when they realized Stefan spent it all drowning in a safe in the quarry, and they hadn’t noticed. 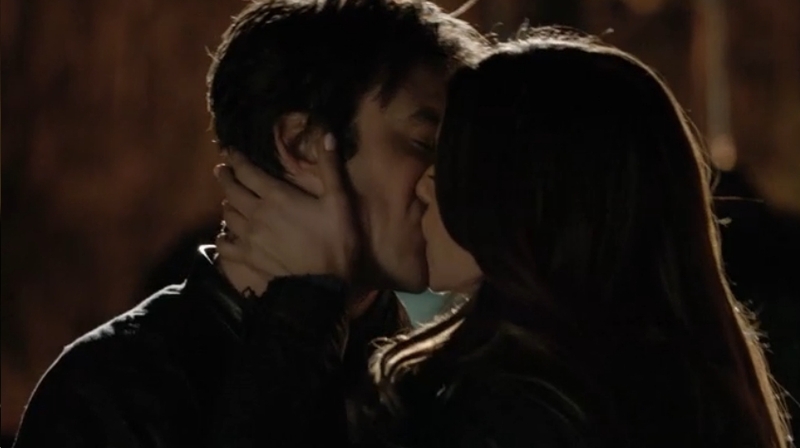 So I suppose, from that perspective, she deserves to be a blubbering mass of tears now that she’s lost Damon for good. But I don’t like it. The happiest moment of the season for me was when she ran into Damon’s arms (escaping Nadia and the Travelers), and felt rescued and safe for one second until Katherine subsumed her personality. Fracking Katherine! 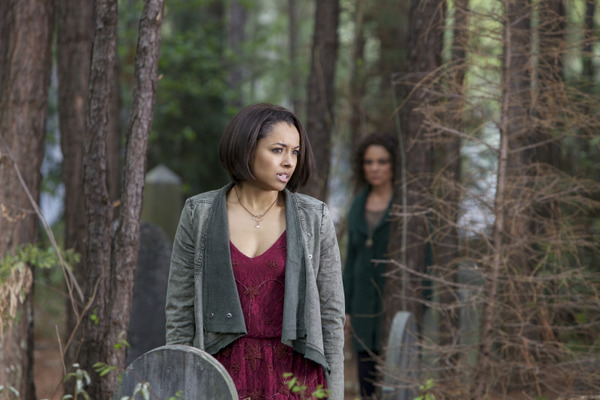 The rest of the season, everybody else was more interesting and more fun than Elena, who hasn’t really been the star of the show since she became a vampire. Was her human moral compass her only personality trait? No, my cheery grade for this episode is for sentimental reasons, because as the Other Side continues to shred, we get to see as many old faces as we usually do on an anniversary or a Halloween episode. And for once, they are the right old faces: Grams, Lexi and Alaric! Oh, and Stephan and Enzo, who are more recently dead. Bonnie, having been fed up with Liv and Luke’s manipulations, feels they owe her to come up with a way to bring everyone back, and she convinces them through righteous indignation alone. They never seemed that fond of their coven, anyway. So Liv runs the spell in a crypt while Luke guards (for once, not splitting up when in danger), and Bonnie prepares for a mass murder of all the Travelers, which should blow open the doors (yes, that means Bonnie herself) forever more. And you know what? The Travelers are such dicks; I’m totally on board with the kamikaze bombing plan of Elena and Damon. And I love the human involvement, as Jeremy and Matt use the catacombs the Travelers might not know about to open the gas lines, and Liz stalls and manages to convince everyone that a getting to know you party with the Sherriff is the right thing to do. Which, c’mon, that’s stupid, but so are the Travelers. Have any of these folks noticed that they are literally playing with life and death? That the only one of them who doesn’t have to die at all is Caroline, who has kept her wits about her as usual? Again, when the Travelers purposefully execute Julian (in Tyler’s body), knowing both that his neck will snap itself and he’ll burn alive without magic, you kinda think they have it coming. Meanwhile, Lexi and Stefan get some good “auld lang syne” ghostly bonding time, Grams gets to impart some final messages (and protections) to Bonnie, and RICK IS BACK, PEOPLE!!!! 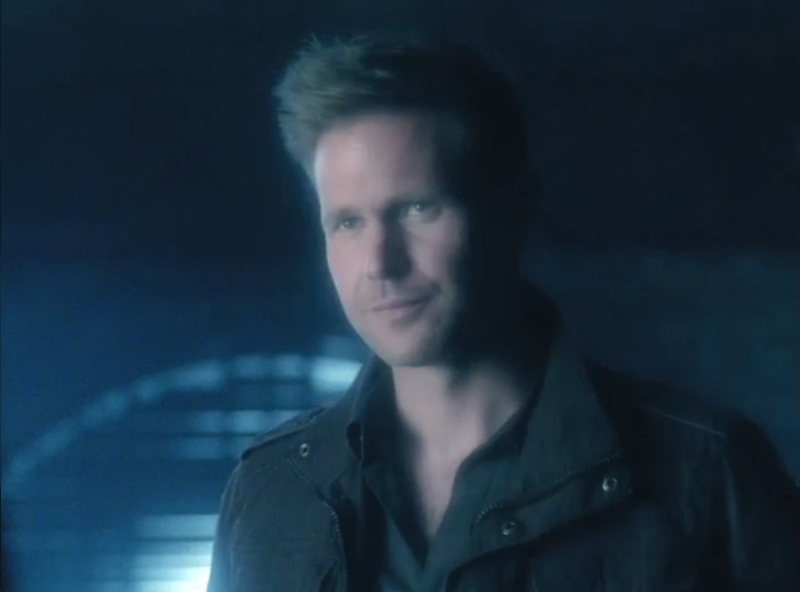 The one character who should never have died, the primary character whom Damon of all people can’t keep going without, the wisest human to ever be scarred by vampires and come back fighting, Alaric at last has a second chance! Pretty much prayers answered there and worthy of five stars if not for all the Elena blubbering. Nice view of her and Damon’s crispy corpses when they crash their car into the bar, though. Cool moments: when Markos realizes he’s dead, he immediately starts threatening Bonnie, until Lexi throws both their asses into the great beyond that even Bonnie can’t control. Bonnie makes her own choices about who to bring back to some extent. Tyler may be just a wolf again, no longer a vamp, and maybe even only a potential wolf. Stefan is going to have his chance with Caroline. Enzo apparently is here to stay (“you don’t have to ask me twice!” he yells as he jumps through Bonnie). 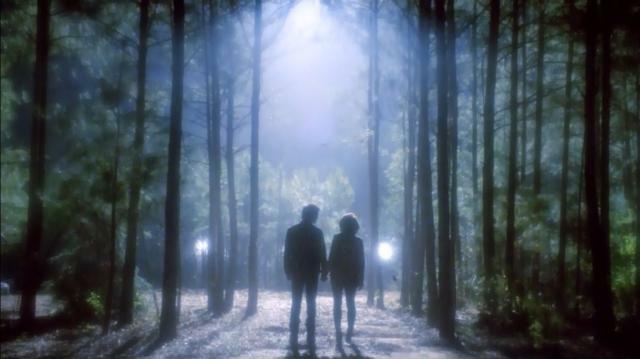 And Damon and Bonnie, never each other’s favorites, face the bright white light together, like troopers. Since Esther’s apparently going to be busy in New Orleans, let’s keep next season Originals free, please? Though I don’t mind if Liv and Luke return, as in the smartest action they’ve ever taken, they high-tail their witch asses out of there when nobody’s looking! Vampires may be beautiful, but they will kill you.